21 ft Reinell Fishing/Cruising Boat Date: 2011-11-12, 6:21PM This boat was recently Re-Powered and Gel Coat was done in 2004. 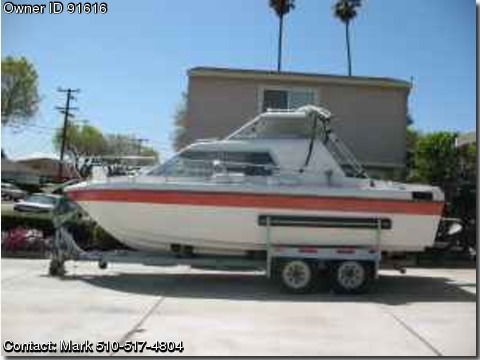 Excellent condition, Reinell Fishing-Cruising boat. This is a serious Fishing boat. It is fully equipped and ready to go. The engine has only 70 hours, with fresh water closed cooling system. New engine and outdrive are not even broken in yet. New Mercruiser 5.0 MPI (Multi Port Injection) 260 hp. Equipped with fresh water closed cooling system. The complete Re-Power package was installed in 2004. 2. New Mercruiser Bravo One sterndrive with 4 blade stainless steel prop. 3. New 2007 4 stroke 9.8hp Tohatsu outboard (AKA Nissan outboard) equipped with electric starter, separate remote control station, and EZ assist steering. 4. Entire boat's Gel Coat was done in 2004. 5. Tel Flex Hydraulic steering system. 6. On board 2 stations battery charger. 7. New Mercruiser Smart Gauges. 8. Pioneer stereo radio/CD/CD-R/MP3 player and ipod hook up ready. 9. Complete Raymarine A65 package equipped with Raystar 123 WAAS GPS sensor, fish finder, DSM 30 digital sounder module and Navionics 2009 Gold series chart plotter software. 10. 8ft VHF antenna, 6db and fixed mount VHF Raymarine radio, equipped with external speaker, to be heard loud and clear. 11. New marine Blue Sea fuse blocks amd marine grade wiring. 12. Blue Sea dual circuit ignition isolation system to protect electronics during start. 13. 20 gallon aerated bait/live well. 14. Bennett Trim Tabs equipped with electronic indicator mounted on dash. 15. Trailer equipped with, 4 wheel Disc surge brakes and Fulton swing tongue. 16. Digital compass and 12V electric horn. 17. 5 stainless steel rod holders. And fishing tackle boxes 18. Dual 110 amph batteries. 19. Swimming platform, and lots more to in this add. You ought to see for yourself. 20. Hardtop, you will come to appreciate this feature, especially when fishing on a sunny or rainy day. Also this boat comes with a brand new portable toilet that has never been used. This boat is super clean and meticulously maintained, ready for fishing or family fun. The boat is ready for the new owner. Make me an offer and I will see what I can do. Must see to appreciate all the work and detail that went into making this boat such a unique find. Boat is in San Leandro.